If they can afford it, I'd look into a Saw Stop. I have space concerns in my shop, and my middle school kids don't use the table saw, so a few years ago I got delta contractor saw. I know you are Junior High/Middle school teacher like I am now, so I'm mainly addressing high school teachers who have students using the table saw. School districts and shop teachers have all been made aware of lawsuits against table saw manufacturers who have ignored flesh detecting technology, it would not be wise for a school district to avoid SawStop because of price, even if the appeal process may suggest we could. When I approached my former school about this safe table saw, they immediately responded and I got two 7 hp machines. At the same time I found out that another district was going through a lawsuit about an accident that had happened in their shop. There may be many reasons, but lawsuits like these are partly to blame for wood shop programs being closed in our area. PROCEED WITH CAUTION IF YOU CHOOSE ANY OTHER SAW BASED ON PRICE! Besides all that, the SawStop is a good machine and it really works. I teach students not to pass a blade with their left hand just in case the material does kick back. Notice that the left hand is the one shown in the news report. 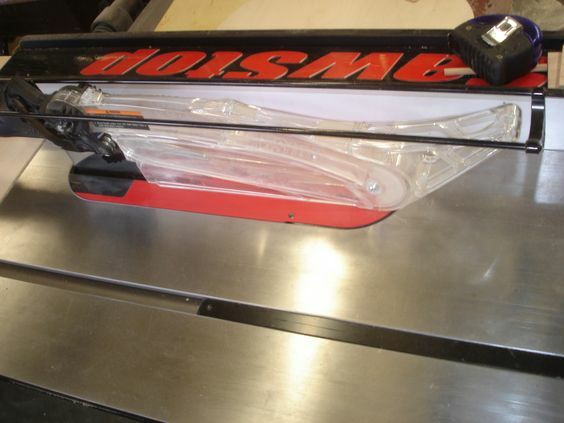 In 2009, Underwriters Laboratories (UL) will require that all new table saw designs include a riving knife. The riving knife on the SawStop works as an anti-kickback devise that are on European table saws. 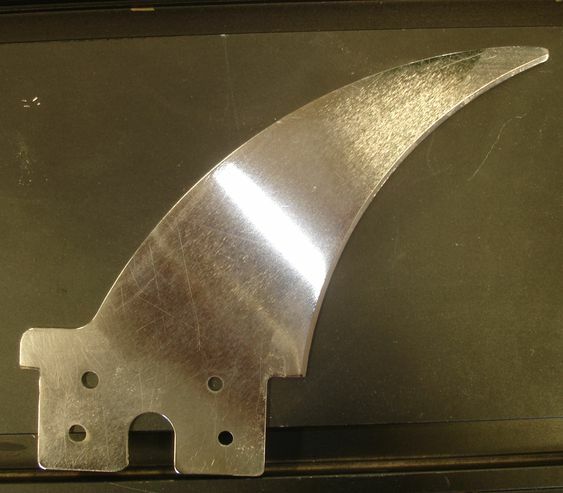 It is a curved steel blade (sharks tale) that reduces the risk of “kickback”, which sometimes pulls an operator’s left hand into the blade. It doesn't need to be removed from the saw when cross-cutting or cutting grooves since it does not extend above the top of the saw blade. If it isn't removed, the operator can't forget to use it. It doesn't interfere with blade guards or dust collectors. It moves with the saw blade as it is raised, lowered and tilted. Whenever we set off the SawStop brake, the brake was sent in to be analyzed unless we absolutely knew it couldn't have been a finger touch. Once was a tape measure. Once was wood with high moisture content. Once was with a substitute who wasn't sure what he had done... etc... In every case where we did end up sending in, we got a free brake (about $60) in return. We rarely found the blade contact site on the student because the blade stops and drops so fast that it hardly ever left even a mark. Even though you can sometimes remove the blade from the brake and use it again, always replace the blade too. I once re-installed the blade on the machine and later noticed a tooth came up missing. Who knows where it went? Replacing the blade and brake is a small price to pay to keep yourself or your district out of court. In the middle of March this year, a local school district had a 6 million dollar lawsuit filed against them for NOT having SawStop tablesaws after a student injury. The word is out in the legal circles. Thank you woodnfire... I believe this is a link to the news story about this lawsuit. ***UPDATE*** You may have to unblock the video clip (For example I have to pause/disable Ghostery, No-script, and/or adblock plus) to view it. For those who don't know what these apps are, Firefox lets you add-on these apps to block ads, scripts, and cookies (both the cookies you send out and the ones you receive). These three are my favorites because they are so effective and easy to use. When I go to Youtube, there are no commercials or advertisements that come up on the videos or the page. Not only that, it is also nearly impossible when surfing the Internet to accidentally bring spyware/malware/viruses onto your computer when using these add-ons. It adds a layer of security/privacy effectively stopping advertizes from tracking your computer usage. You can get more information about this by going HERE. Wow. For those of you who aren't familiar with Oregon, Sisters is a small town and 6 million is a HUGE hit. I'm going to take a "safety time out" this afternoon and reiterate the important safety procedures for the table saw. I'm a bit surprised by all of these so-called "misfires". I'm now at the end of my fourth year with a SawStop in my classroom. ALL of my students use the table saw on a daily or near daily basis, and the break hasn't been triggered once. If my students were routinely triggering the saw's breaking system I would think that I'd see that as a giant red flag indicating a very real failure on my part. Our local cabinet shop has also had misfires and SawStop knows about the problems. SawStop tells them to put clear tape over the brake before installing it. I'm curious... Has anyone here had SawStop tell them to put tape over the brake before installation? Be sure you read the entire article.... you can never be too careful these days. Protecting yourself is up to you. Anyone dodging the purchase of a SawStop for their wood shop class needs to take immediate action by printing out a few of these articles and giving them to their administrators and purchasing department. Along with the regular student safety documentation and permission forms, make sure there is documentation of your asking for this saw just in case your district is foolish enough to turn you down. You might also want to further protect yourself by requesting (again keep all documentation) certified training (KCMA.org) (KCMA training PowerPoint) on the proper use of the table saw. Check around because there may be other certified trainers. 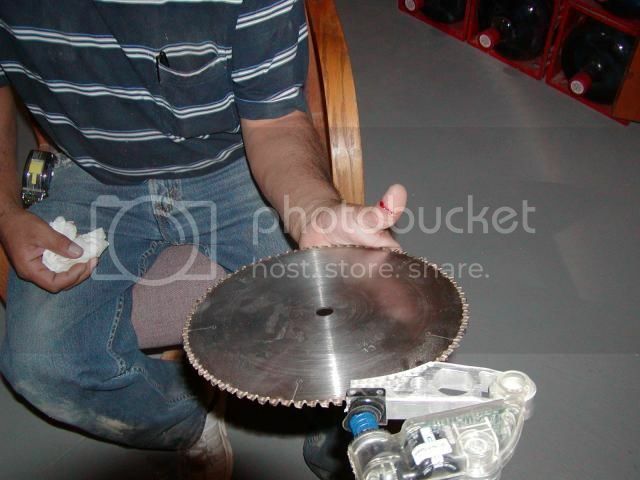 Will have two Sawstops -- which the students will use -- I need to keep one of my old saws for cutting up junk wood as I would hate to have a Sawstop misfire. This society is taking away from people accepting responsibility for there actions -- and instead want to blame every one else. Okay, so after having set up the Sawstops (no mention of tape on units) they are a well made saw. They are easy to use with their safety system. Even though I feel I covered safety very well, this has just put my mind a little more at ease.But I still know and hear when the saw is not cutting right. Just because you don't know what goes on inside of a mind. My only disappointment is that the saws are not American Made. Since we are starting a new year, I though this post in particular should come back to the top as a reminder of what teachers should consider..... for keeping their students and themselves safe. In fact... this should be the most viewed post ever when you think about it. 1. The brake would sometimes go off for no apparent reason. The company would test them anyway and count it as a finger touch and usually replaced them. It cost about $125 to restore it back unless SawStop sends you a free replacement brake, worth about $60. Like I've already said, reusing blades that appear OK is not a good idea. One we tried to salvage ended up losing a tooth and we never determined where that tooth ended up. 2. Sometimes the blade embedded brake was difficult to get out of the machine. Remembering back, it seemed there was an optimum blade height that made it easier to remove. Still, it took time to restore and until you could get to it, the saw would be out of commission. 3. We broken a key. It simply twisted off, and even using the other key, the brake still could not be turned off (if you needed to cut high moisture wood). 4. The blade height lock wedge pieces wore away much too easy and the ground up metal would mix with the grease becoming so thick the crank would barely turn. SawStop acknowledged the problem and gave me new ones, but they quickly did the same thing again, so I removed them completely. 5. The surface flush door latch to hold the lower compartment door shut, quit working. I had to rig something to keep it closed to hold down (close) the open door switch so the saw could run. 6. The small dust port would always get clogged leaving the saw dust to spill into the lower base of the saw. By the time you'd catch it, it was way over full, causing you to have to stop everything and clean it out. This happened all the time at the cabinet shop too. If you haven't had to clean one of these out on a regular basis, it's not exactly easy, especially when they were made to not fill up with dust all the time. 7. It was sometimes finicky. The error lights would light or blink codes even when nothing was wrong. You would have to shut it down and restart it multiple times to reset/clear the computer. Would I get SawStops again if my classes needed them? In a heart beat! Peace of mind wins out in the end. I witnessed at least one clear time when the brake did save an actual student's finger and I have this photo of the one time it happened at the cabinet shop too. It only takes once to show it's well worth it even with the annoying issues. Hopefully SawStop have/will run across these issues and get them ironed out. If I were them, I wouldn't want people to be talking about SawStop in a negative way. There is a new $1500 alternative to SawStop, but I'm not sure if it is made in any other size than the (contractor) or portable job site version as they call it. Replacement cartridges contain a flip-over two component... that fires like car airbags.... to push the saw down below the table in milliseconds... while leaving a usable blade. That means no brake and no replacing a blade every time it goes off and a double flip-over cartridge means you aren't left without a table saw in a pinch. That also means replacements are a little cheaper at between $45 and $50 for the single (that's between $90 and $100 for the double cartridge... they only come as a flip-over double cartridge) as opposed to SawStop which it $69 for a single (and does not come as a double and also doesn't include the price of the new blade). By the demonstration, it appears quick to switch cartridges and get back to work as opposed to SawStop which gave me issues with downtime changing out the cartridge. Here is the Bosch promotional video. That same cartridge works for both a regular blade and dado blades making only one replacement size unlike SawStop where you have to keep two different sizes and make the time-consuming switch. Watch for the SawStop infringement lawsuit results before you plan a purchase. Even though this technology appears different from SawStop, they are vigorously defending their patent as this article shows in Woodworkers Journal. After all, SawStop first offered this technology to every other manufacturer and while the cartridge technology seems different, the detection electronics may actually be identical. According to the article, they expect a final decision by August 2016. I like what I'm seeing with this saw and I might be able to convince my school that this would be a worthwhile investment to save the instructor's fingers... since middle school students wouldn't be using it. It looks like a good saw for the money. Available at Lowes. Updated: 1/27/2017 – Final Nail in the Coffin for Bosch Reaxx? "The U.S. International Trade Commission (ITC) issued a limited exclusion order against Robert Bosch Tool Corporation and Robert Bosch GmbH. This more or less prevents them from selling either the Reaxx saw or parts for the Reaxx saw in the United States. Further, they issued a cease and desist order against Robert Bosch Tool Corporation. They’ve also terminated (closed) the investigation with respect to the ’836 and ’450 patents. SawStop’s withdrew their allegations on those patents. Not all of Sawstop’s claims proved valid. On September 9, 2016, the ALJ issued his final initial determination. They found a violation of section 337 with respect to the ’927 and ’279 patents. They found no violation of section 337 with respect to the ’712 and ’455 patents. But two patent violations remain, and that’s enough for the ITC to issue a final decision essentially barring Reaxx (the saw, parts, and cartridges) from the U.S. under s cease and desist order." I thought it might be a good idea to float this back to the top for anybody who is new to teaching wood shop. 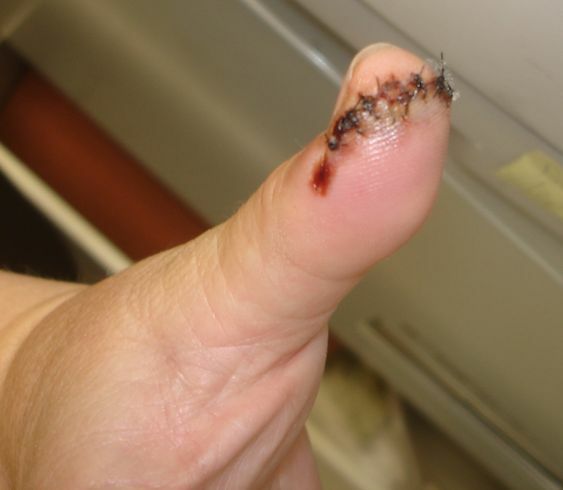 This is a thumb photo taken a week after one of our office staff had cut herself on an old tablesaw that she uses at home. I also wanted to let you know that SawStop seems to have noticed some of the same problems I've talked about and they have done something about it in their new designs. 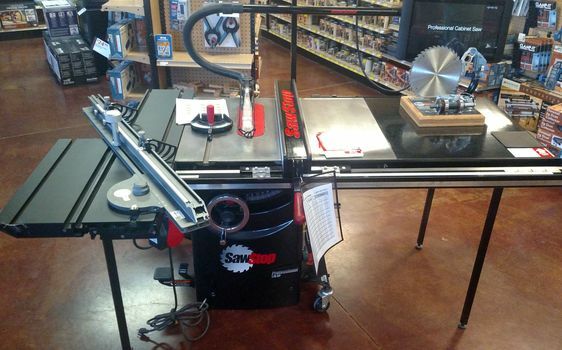 The saw I have now was the floor Rockler store model, so it came already set up. 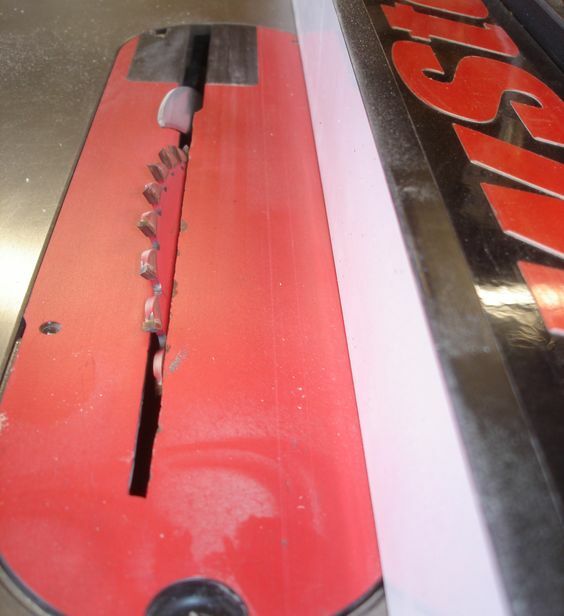 We have been using the saw a lot for slicing up cutting board material in a variety of hardwoods. It has not failed once. As I was taking this photo, I noticed the plastic tape barrier already on the brake. Since we have not even tried to change the blade, there is no news to report on this topic. Runs up and down and tilts (in the opposite direction which is very nice) with none of the previous issues. 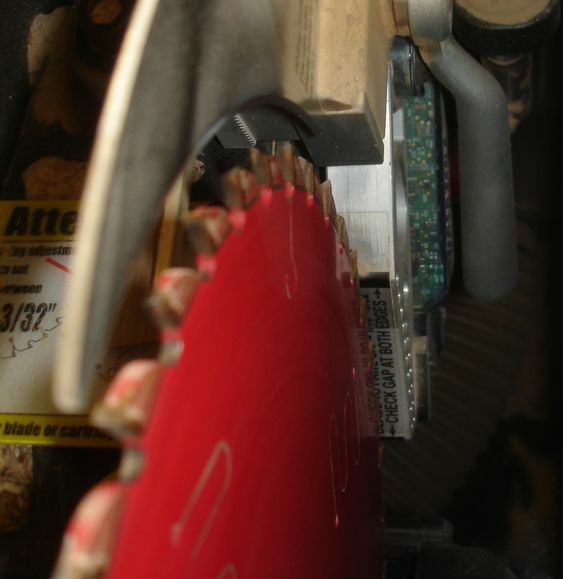 You can see in this left tilt photo that the riving knife also comes with the SawStop and is used on all European saws because it makes the saw safer. Here it is off the saw. The access to the lower compartment has moved to the other side where it is much more convenient. It does not contain that same latch, and is a smaller molded plastic door. Access to the lower compartment is much easier. Some of that may have been the old style dust collector we had with 4" pipe running 40 feet under a concrete floor. Who knows if the 1966 pipes had rusted through. I know there was a spring close by and when the maintenance had to shore up a pillar near the office, there was water under the floor. No reason to believe it wasn't in other areas of the building too, but all that is moot. The left side access makes clean out much easier. I've only had one blinking code that was due to turning off the saw with the wrong switch. I have not replaced a brake or blade and have not had any other issues with this so far. SawStop won the patent infringement issue. 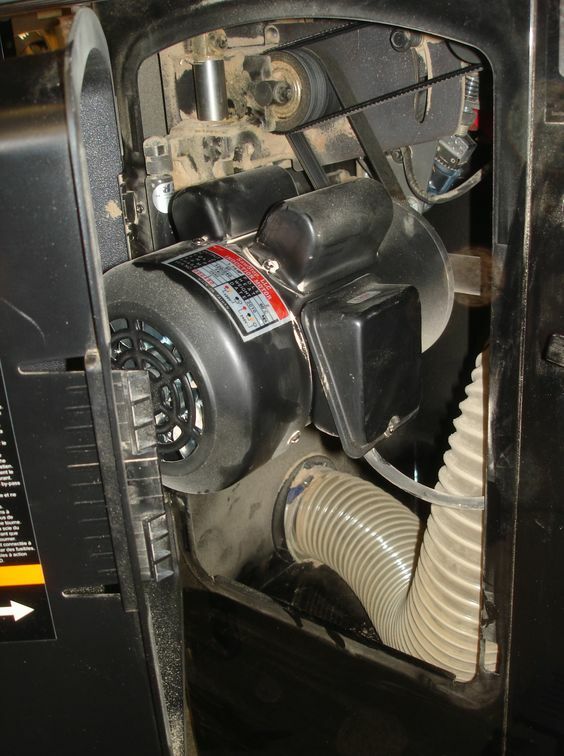 Lastly, if you want to keep the shop cleaner, use the vacuum guard. When I have close cutting to do... without the vacuum guard in place, it sure kicks up a ton of dust.